Why, given the foregoing based on Labour’s 2017 General Election Manifesto, have the people behind Momentum failed to grasp that Labour was clearly pitching for the votes of those whom they mock in their video? Team Corbyn made an unashamed pitch for the middle class vote by pledging universal free university tuition; free universal childcare; free universal school meals; a write off, may be, of student debt; cheaper rail fares and so on. And, if you earned less than £80k per annum, John McDonnell said, you would pay no extra Income Tax and National Insurance for five years or the length of Jeremy Corbyn’s first term as Prime Minister. Moreover, is it wise to promote division within the Labour Party amongst Jeremy Corbyn’s most ardent fans? This pension income puts Corbyn into the top 40% of income earners. The average income is around £27,000 per year and 60% earn that amount or less. Should Corbyn ever retire then it is estimated that his MP’s occupational pension will, in today’s money, amount to £50,000 per year. 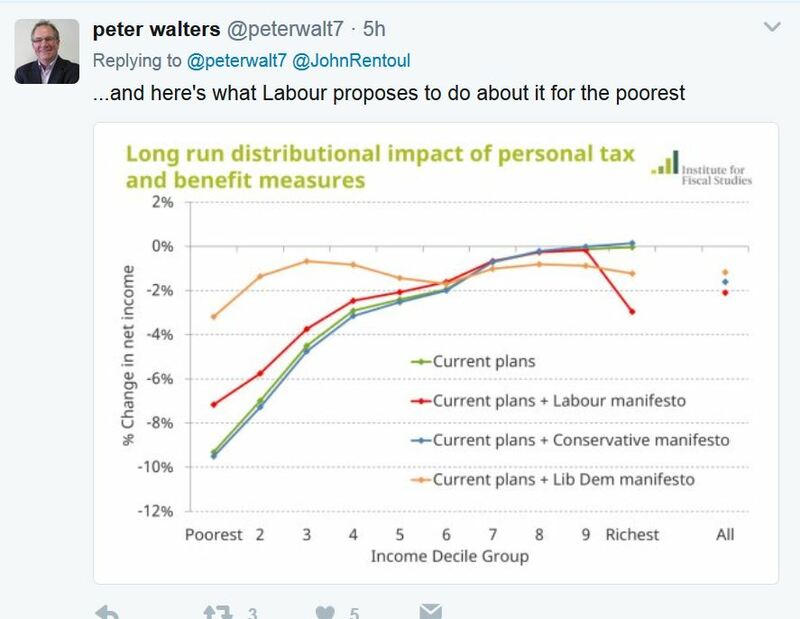 Adding that figure to the £36,049.90 above, we come to a grand total of £86,049.90 which would put Corbyn, today, into the top 5% of income earners. 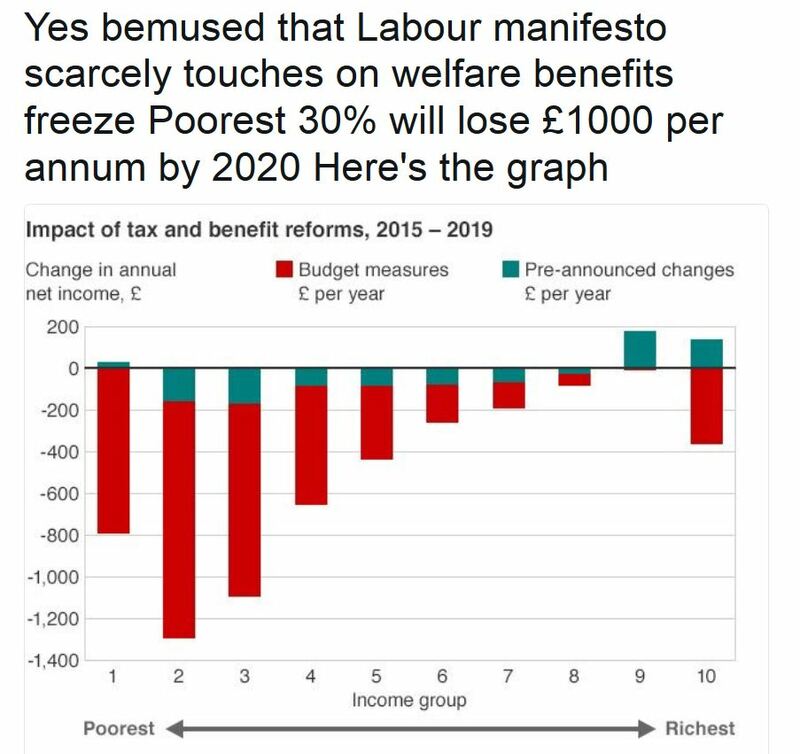 Corbyn, incidentally, does not think himself wealthy on £138,000 per year. Is Corbyn’s brand of Islington Socialism, Labour, an organised hypocrisy? Is #Corbyn’s brand of Islington Socialism, #Labour, an organised hypocrisy? 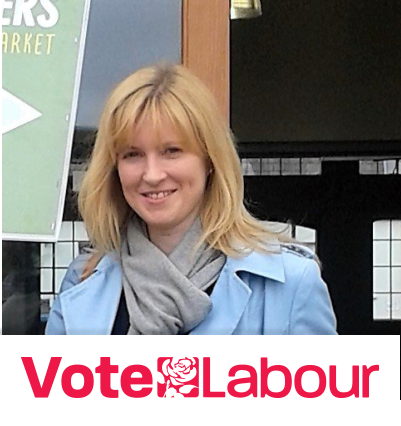 New Canterbury Labour MP Rosie Duffield campaigned on an anti-grammars platform at the General Election. Both of Ms Duffield’s sons went to Simon Langton Grammar School in Canterbury. Ms Duffield told a Canterbury Christ Church hustings in May that the Kent Test was “horrible, divisive and stressful”, but also revealed both her sons had gone to grammar schools – with one still attending and the other deciding it was “too competitive”. But the Labour Party has hit back at attempts to smear Ms Duffield, saying you, “can’t opt out of the system (despite Miss Duffield saying one of her sons was no longer attending Simon Langton Grammar School), but you can disagree with it”. A spokesperson for Ms Duffield said, “As far as we are concerned this is just an attempt by the Conservatives to raise the profile of Daniel Hamilton. He doesn’t live here, as far we know he lives between London and Stockport. Rosie cannot opt out and choose to go to a comprehensive. With regards to the education of her son, she has worked within the constraints of the system she’s been given. Kent is a grammar county. 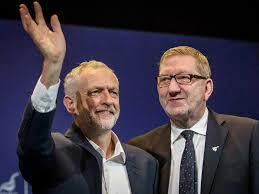 The few to whom Labour pledged universal free university tuition, free universal childcare, free universal school meals, cheaper rail fares … And, if they are earning less than £80,000 per year, no Income Tax and National Insurance increases for five years or for the length of of Corbyn’s first Parliamentary term as Prime Minister. One would think, going by Labour’s rebuttal, that there are no secondary schools, other than grammar schools, within the Canterbury constituency, or for that matter, Kent. Also, that there are no non selective schools. Never mind, may be, writing off student debt, what about writing off Council Tax arrears? Has anyone seen I, Daniel Blake lately Corbyn and Ken Loach? Lloyd George never spoke to crowds at Glastonbury #Corbyn They wouldn’t have liked it #Labour if he had! A few months ago a meeting was held not far from this hall in the heart of the City of London, demanding that the Government should launch into enormous expenditure on the Navy. That meeting ended up with a resolution promising that those who passed the resolution would give financial support to the Government in their undertaking. There have been two or three meetings held in the City of London since, attended by the same class of people but not ending up with a resolution promising to pay. On the contrary, we are spending the money, but they wont pay. What has happened since to alter their tone? Simply that we have sent in the bill. We started our four Dreadnoughts. They cost eight millions of money. We promised them four more. They cost another eight millions. Somebody has got to pay; and then these gentlemen say: Perfectly true; somebody has got to pay but we would rather that somebody were somebody else. We started building; we wanted money to pay for the building; so we sent the hat round. We sent it round amongst the workmen and winders of Derbyshire and Yorkshire, the weavers of High Peak and the Scotsmen of Dumfries who, like all their countrymen, know the value of money. They all dropped in their coppers. We went round Belgravia; and there has been such a howl ever since that it has completely deafened us. But they say ‘It is not so much the Dreadnoughts we object to; it is Pensions’. If they objected to Pensions, why did they promise them? They won elections on the strength of their promises. It is true they never carried them out. Deception is always a pretty contemptible vice, but to deceive the poor is the meanest of all. But they say, ‘When we promised Pensions, we meant Pensions at the expense of people for whom they were provided. We simply meant to bring in a Bill to compel workmen to contribute to their own Pensions’. If that is what they meant why did they not say so? The Budget, as your Chairman has already so well reminded you, is introduced not merely for the purpose of raising barren taxes, but taxes that are fertile, taxes that will bring forth fruit – the security of the country, which is paramount in the minds of all. The provision for the aged and deserving poor – it was time it was done. It is rather a shame for a rich country like ours – probably the richest in the world, if not the richest the world has ever seen, that it should allow those who have toiled all their days to end in penury and possibly starvation. It is rather hard that an old workman should have to find his way to the gates of the tomb, bleeding and footsore, through the brambles and thorns of poverty. We cut a new path for him, an easier one, a pleasanter one, through fields of waving corn. We are raising money to pay for the new road, aye, and to widen it, so that 200,000 paupers shall be able to join in the march. There are so many in the country blessed by Providence with great wealth, and if there are amongst them men who grudge out of their riches a fair contribution towards the less fortunate of their fellow-countrymen they are very shabby rich men. We propose to do more by means of the Budget. We are raising money to provide against the evils and the sufferings that follow from unemployment. We are raising money for the purpose of assisting our great friendly societies to provide for the sick and the widows and orphans. We are providing money to enable us to develop the resources of our own land. I do not believe any fair-minded man would challenge the justice and the fairness of the objects which we have in view in raising this money. But there are some of them who say, ‘The taxes themselves are unjust, unfair, unequal, oppressive notably so the land taxes’. They are engaged, not merely in the House of Commons, but outside the House of Commons, in assailing these taxes with a concentrated and sustained ferocity which will not allow even a comma to escape with its life. Now, are these taxes really so wicked? Let us examine them; because it is perfectly clear that the one part of the Budget that attracts all the hostility and animosity is that part which deals with the taxation of land. Well, now let us examine it. I do not want you to consider merely abstract principles. I want to invite your attention to a number of concrete cases; fair samples to show you how in these concrete illustrations our Budget proposals work. Now let us take them. Let us take first of all the tax on undeveloped land and on increment. During the time it was ripening the landlord was paying his rates and taxes, not on £2 or £3 an acre. It was agricultural land, and because it was agricultural land a munificent Tory Government voted a sum of two millions to pay half the rates of those poor distressed landlords, and you and I had to pay taxes in order to enable those landlords to pay half their rates on agricultural land, while it was going up every year by hundreds of pounds through your efforts and the efforts of your neighbours. Well, now, that is coming to an end. On the walls of Mr Balfour’s meeting last Friday were the words: ‘We protect against fraud and folly. So do I. These things I am gong to tell you of have only been possible up to the present through the fraud of the few and the folly of the many’. Now, what is going to happen in the future? In future those landlords will have to contribute to the taxation of the country on the basis of the real value – only one halfpenny in the pound! Only a halfpenny! And that is what all the howling is about. But there is another little tax called the increment tax. For the future what will happen? We mean to value all the land in the kingdom. And here you can draw no distinction between agricultural land and other land, for the simple reason that East and West Ham was agricultural land a few years ago! And if land goes up in the future by hundreds and thousands an acre through the efforts of the community, the community will get 20 per cent. of that increment. Ah! What a misfortune it is that there was not a Chancellor of the Exchequer who did this thirty years ago. Only thirty years ago, and we should now be enjoying an abundant revenue from this source. Now I have given you West Ham. Let me give you a few more cases. Take cases like Golders Green and other cases of similar kind where the value of land has gone up in the course, perhaps, of a couple of years through a new tramway or a new railway being opened. Golders Green is a case in point. A few years ago there was a plot of land there which was sold at £160. Last year I went and opened a Tube railway there. What was the result? This year that very piece of land has been sold for £2,100 – £160 before the railway was opened – before I was there – £2,100 now. I am entitled to 20 per cent. Now there are many cases where landlords take advantage of the exigencies of commerce and of industry – take advantage of the needs of municipalities and even of national needs and of the monopoly which they have got in land in a particular neighbourhood in order to demand extortionate prices. Take the very well known case of the Duke of Northumberland when a County Council wanted to buy a small plot of land as a site for a school to train the children, who in due course would become the men labouring on his property. The rent was quite an insignificant thing. His contribution to the rates – I forget – I think it was on the basis of 30s. an acre. What did he demand for it for a school? £900 an acre. All we say is this – Mr Buxton and I say – if it is worth £900, let him pay taxes on £900. There are several of these cases that I want to give to you. Take the town of Bootle, a town created very much in the same way as these towns in the East of London – purely by the commerce of Liverpool. In 1879, the rates of Bootle were £9,000 a year – the ground rents were £10,000 – so that the landlord was receiving more from the industry of the community than all the rates derived by the municipality for the benefit of the town. In 1898 the rates had gone up to £94,000 a year – for improving the place, constructing roads, laying out parks and extending lighting and opening up the place. But the ground landlord was receiving in ground rents £100,000. It is time that he should pay for this value. A case was given me from Richmond which is very interesting. The Town Council of Richmond recently built some workmen’s cottages under a housing scheme. The land appeared on the rate-book as of the value of £4, and being agricultural the landlord paid only half the rates, and you and I paid the rest for him. It is situated on the extreme edge of the borough, therefore not very accessible, and the Town Council naturally thought they would get it cheap. But they did not know their landlord. They had to pay £2,000 an acre for it. The result is that instead of having a good housing scheme with plenty of gardens and open space, plenty of breathing space, plenty of room for the workmen at the end of their days, forty cottages had to be crowded on two acres. Now if the land had been valued at its true value, the landlord would have been at any rate contributing his fair share of the public revenue, and it is just conceivable that he might have been driven to sell at a more reasonable price. I do not want to weary you with these cases. But I could give you many. I am a member of a Welsh County Council, and landlords even in Wales are not more reasonable. The police committee the other day wanted a site for a police station. Well, you might have imagined that if a landlord sold land cheaply for anything it would have been for a police station. The housing of the working classes that is a different matter. But a police station means security for property. Not at all. The total population of Carnarvonshire is not as much – I am not sure it is as great – as the population of Limehouse alone. It is a scattered area; no great crowded populations there. And yet they demanded for a piece of land which was contributing 2s. a year to the rates, £2,500 an acre! All we say is, If their land is as valuable as all that, let it have the same value in the assessment book as it seems to possess in the auction-room. There are no end of these cases. There was case from Greenock the other day. The Admiralty wanted a torpedo range. Here was an opportunity for patriotism! These are the men who want an efficient Navy to protect our shores, and the Admiralty state that one element in efficiency is straight shooting, and say: We want a range for practice for torpedoes on the coast of Scotland. There was a piece of land there. It was rated at something like £11 10s. a year. They went to the landlord – they had to pay for it – well now, just you guess, whilst I am finding it out. It had a rating value of £11 2s., and it was sold to the nation for £27,225. And these are the gentlemen who accuse us of robbery and spoliation! Now all we say is this: In future you must pay one halfpenny in the pound on the real value of your land. In addition to that, if the value goes up – not owing to your efforts – if you spend money on improving it we will give you credit for it – but if it goes up owing to the industry and the energy of the people living in that locality, one-fifth of that increment shall in future be taken as a toll by the State. They say: Why should you tax this increment on landlords and not on other classes of the community? They say: You are taxing the landlord because the value of his property is going up through the growth of population, through the increased prosperity for the community. Does not the value of a doctor’s business go up in the same way? Ah, fancy their comparing themselves for a moment! What is the landlord’s increment? Who is the landlord? The landlord is a gentleman – I have not a word to say about him in his personal capacity – the landlord is a gentleman who does not earn his wealth. He does not even take the trouble to receive his wealth. He has a host of agents and clerks to receive it for him. He does not even take the trouble to spend his wealth. He has a host of people around him to do the actual spending for him. He never sees it until he comes to enjoy it. His sole function, his chief pride, is stately consumption of wealth produced by others. What about the doctor’s income? 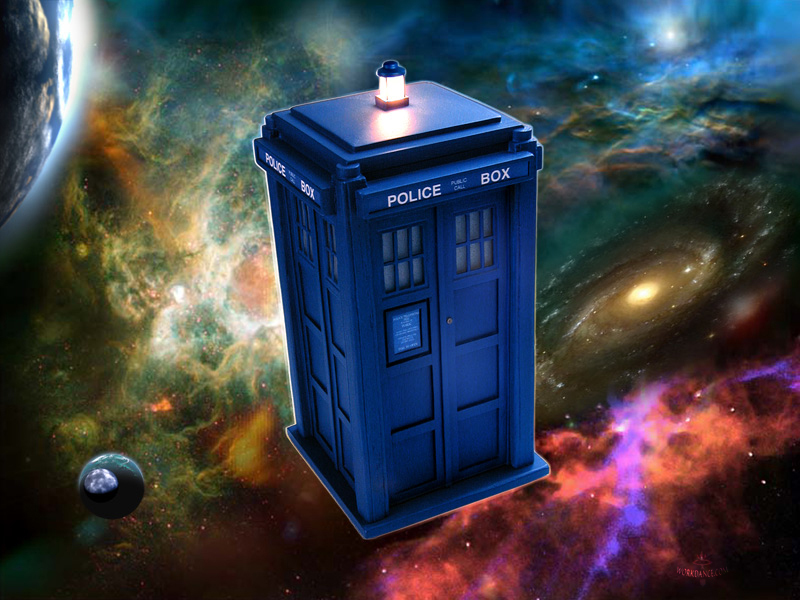 How does the doctor earn his income? The doctor is a man who visits our homes when they are darkened with the shadow of death: who, by his skill, his trained courage, his genius, wrings hope out of the grip of despair, wins life out of the fangs of the Great Destroyer. All blessings upon him and his divine art of healing that mends bruised bodies and anxious hearts. To compare the reward which he gets for that labour with the wealth which pours into the pockets of the landlord purely owing to the possession of his monopoly is a piece – if they will forgive me for saying so – of insolence which no intelligent man would tolerate. Now that is the halfpenny tax on unearned increment. Now I come to the reversion tax. What is the reversion tax? You have got a system in the country which is not tolerated in any other country of the world, except, I believe, Turkey; the system whereby landlords take advantage of the fact that they have got complete control over the land to let it for a term of years, spend money upon it in building, in developing it. You improve the building, and year by year the value passes into the pockets of the landlord, and at the end of sixty, seventy, eighty or ninety years the whole of it passes away to the pockets of a man who never spent a penny upon it. In Scotland they have a system of nine hundred and ninety-nine years lease. The Scotsmen have a very shrewd idea that at the end of nine hundred and ninety-nine years there will probably be a better land system in existence, and they are prepared to take their chance of the millennium coming round by that time. But in this country we have sixty years leases. I know districts – quarry districts in Wales where a little bit of barren rock where you could not feed a goat, where the landlord could not get a shilling an acre for agricultural rent, is let to quarrymen for the purpose of building houses, where 30s or £2 a house is charged for ground rent. The quarryman builds his house. He goes to a building society to borrow money. He pays out of his hard-earned weekly wage contributions to the building society for ten, twenty or thirty years. By the time he becomes an old man he has cleared off the mortgage, and more than half the value of the house has passed into the pockets of the landlord. You have got cases in London here. There is the famous Gorringe case. In that case advantage was taken of the fact that a man has built up a great business, and they say: Here you are, you have built up a great business, you cannot take it away; you cannot move to other premises because your trade and goodwill are here; your lease is coming to an end, and we decline to renew it except on the most oppressive terms. The Gorringe case is a very famous case. It was the case of the Duke of Westminster. Oh, these dukes, how they harass us! Mr Gorringe had got a lease of the premises at a few hundred pounds a year ground rent. He built up a great business there. He was a very able business man, and when the end of the lease came he went to the Duke of Westminster, and he said: Will you renew my lease? I want to carry on my business here. He said: Oh yes, I will; but I will do it on condition than the few hundreds a year you pay for ground rent shall in the future be £4,000 a year. In addition to that he had to pay a fine – a fine, mind you! – of £50,000, and he had to build up huge premises at enormous expense according to plans submitted to the Duke of Westminster. All I can say to this – if it is confiscation and robbery for us to say to that duke, being in need of money for public purposes, we will take 10 per cent. of all you have got, for that purpose, what would you call his taking nine-tenths from Mr Gorringe? These are the cases we have got to deal with. Look at all this leasehold system. This system – it is the system I am attacking, not individuals – is not business, it is blackmail. I have no doubt some of you have taken the trouble to peruse some of these leases, and they are really worth reading, and I will guarantee that if you circulate copies of some of these building and mining leases at Tariff Reform meetings, and if you can get workmen at those meetings and the business men to read them, they will come away sadder but much wiser men. What are they? Ground rent is a part of it – fines, fees; you are to make no alteration without somebody’s consent. Who is that somebody? It is the agent of the landlord. A fee to him. You must submit the plans to the landlords architect and get his consent. There is a fee to him. There is a fee to the surveyor; and then, of course, you cannot keep the lawyer out – he always comes in. And a fee to him. Well, that is the system, and the landlords come to us in the House of Commons and they say: If you go on taxing reversions we will grant no more leases? Is not that horrible? No more leases! No more kindly landlords with all their retinue of good fairies – agents, surveyors, lawyers – ready always to receive ground rents, fees, premiums, fines, reversions – no more, never again! They will not do it. We cannot persuade them. They wont have it. The landlord has threatened us that if we proceed with the Budget he will take his sack clean away from the hopper, and the grain which we are all grinding our best to fill his sack will go into our own. Oh, I cannot believe it. There is a limit even to the wrath of outraged landlords. We must really appease them; we must offer up some sacrifice to them. Suppose we offer the House of Lords to them? Well, you seem rather to agree with that. I will make the suggestion to them. Now, unless I am wearying you, I have just one other land tax, and that is a tax on royalties. The landlords are receiving eight millions a year by way of royalties. What for? They never deposited the coal there. It was not they who planted these great granite rocks in Wales, who laid the foundations of the mountains. Was it the landlord? And yet he, by some divine right, demands as his toll – for merely the right for men to risk their lives in hewing these rocks – eight millions a year. Take any coalfield. I went down to a coalfield the other day, and they pointed out to me many collieries there. They said: ‘You see that colliery there. The first man who went there spent a quarter of a million in sinking shafts, in driving mains and levels. He never got coal, and he lost his quarter of a million. The second man who came spent 100,000 – and he failed. The third man came along, and he got the coal’. What was the landlord doing in the meantime. The first man failed; but the landlord got his royalty, the landlord got his dead-rent – and a very good name for it. The second man failed, but the landlord got his royalty. These capitalists put their money in, and I said: ‘When the cash failed what did the landlord put in?’ He simply put in the bailiffs. The capitalist risks, at any rate, the whole of his money; the engineer puts his brains in; the miner risks his life. I was telling you I went down a coalmine the other day. We sank into a pit half a mile deep. We then walked underneath the mountain, and we did about three-quarters of a mile with rock and shale above us. The earth seemed to be straining – around us and above us – to crush us in. You could see the pit-props bent and twisted and sundered until you saw their fibres split in resisting the pressure. Sometimes they give way, and then there is mutilation and death. Often a spark ignites, the whole pit is deluged in fire, and the breath of life is scorched out of hundreds of breasts by the consuming flame. In the very next colliery to the one I descended just a few years ago three hundred people lost their lives in that way. And yet when the Prime Minister and I knock at the door of these great landlords, and say to them: ‘Here, you know these poor fellows who have been digging up royalties at the risk of their lives, some of them are old, they have survived the perils of their trade, they are broken, they can earn no more. Wont you give them something towards keeping them out of the workhouse?’ they scowl at us, and we say: ‘Only a hapenny, just a copper’. They say: ‘You thieves!’ and they turn their dogs on to us, and you can hear their bark every morning. If this is an indication of the view taken by these great landlords of their responsibility to the people who at the risk of life create their wealth, then I say their day of reckoning is at hand. The other day at the great Tory meeting held at the Cannon Street Hotel they had blazoned on the walls, ‘We protest against the Budget in the name of democracy, liberty and justice’. Where does the democracy come in in this landed system? Where is the liberty in our leasehold system? Where is the seat of justice in all these transactions? I claim that the tax we impose on land is fair, is just and is moderate. They go on threatening that if we proceed, they will cut down their benefactions and discharge labour. What kind of labour? What is the labour they are going to choose for dismissal? Are they going to threaten to devastate rural England by feeding and dressing themselves? Are they going to reduce their gamekeepers? Ah, that would be sad! The agricultural labourer and the farmer might then have some part of the game which they fatten with their labour. But what would happen to you in the season? No week-end shooting with the Duke of Norfolk or anyone. But that is not the kind of labour they are going to cut down. They are going to cut down productive labour – their builders and their gardeners – and they are going to ruin their property so that it shall not be taxed. All I can say is this – the ownership of land is not merely an enjoyment, it is a stewardship. It has been reckoned as such in the past; and if they cease to discharge their functions, the security and defence of the country, looking after the broken in their villages and in their neighbourhoods then these functions which are part of the traditional duties attached to the ownership of land, and which have given to it its title – if they cease to discharge those functions, the time will come to reconsider the conditions under which the land is held in this country. No country, however rich, can permanently afford to have quartered upon its revenue a class which declines to do the duty which it was called upon to perform since the beginning. And, therefore, it is one of the prime duties of statesmanship to investigate those conditions. But I do not believe it. They have threatened and menaced like that before. They have seen it is not to their interest to carry out these futile menaces. They are not protesting against paying their fair share of taxation of the land, and they are doing so by saying: ‘You are burdening industry; you are putting burdens upon the people which they cannot bear’. Ah! They are not thinking of themselves. Noble souls! It is not the great dukes they are feeling for, it is the market gardener, it is the builder; and it was, until recently, the smallholder. In every debate in the House of Commons they said: ‘We are not worrying for ourselves. We can afford it without broad acres; but just think of the little man who has only got a few acres’. And we were so very impressed with this tearful appeal that at last we said: We will leave him out. And I almost expected to see Mr Pretyman jump over the table when I said it, fall on my neck and embrace me. Instead of that he stiffened up, his face wreathed with anger, and he said: ‘The Budget is more unjust than ever’. We are placing burdens on the broadest shoulders. Why should I put burdens on the people? I am one of the children of the people. I was brought up amongst them. I know their trials; and God forbid that I should add one grain of trouble to the anxieties which they bear with such patience and fortitude. When the Prime Minister did me the honour of inviting me to take charge of the National Exchequer at a time of great difficulty, I made up my mind, in framing the Budget which was in front of me, that at any rate no cupboard should be barer, no lot would be harder. By that test I challenge them to judge the Budget. 500m out of an estimated world population in 1940 of 2,300m. 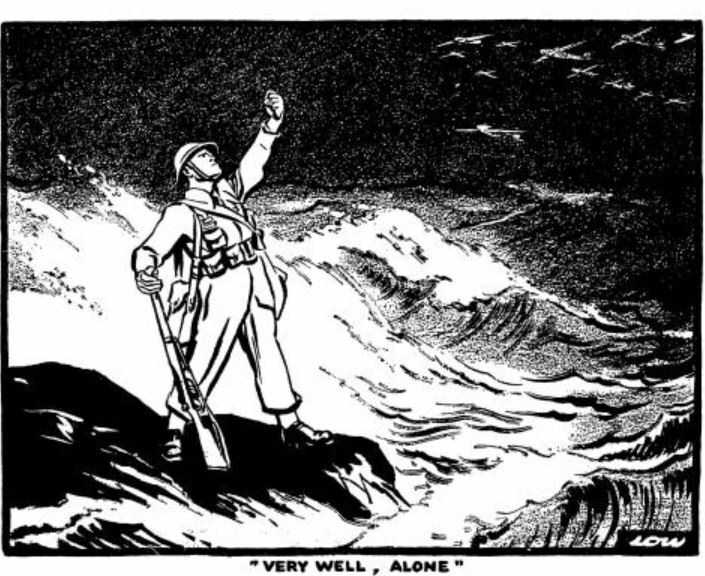 Incidentally, Sir David Alexander Cecil Low was a political cartoonist and caricaturist who lived and worked in the United Kingdom for many years. 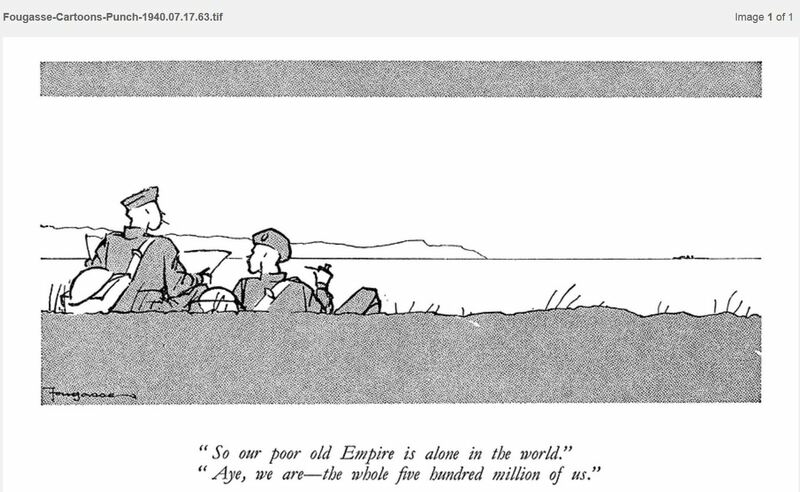 Low was a self-taught cartoonist. He was born in New Zealand in 1891, worked in his native country before migrating to Sydney, Australia in 1911, and ultimately to London in 1919. Cyril Kenneth Bird, pen name Fougasse was born in London, the heart of Empire and as a cartoonist is best known for his editorship of Punch magazine and his World War II warning propaganda posters. He also designed many posters for the London Underground. Bird was seriously injured during the Gallipoli Campaign during World War I and, as a result, invalided out of the British Army. The campaign is often considered to be the beginning of Australian and New Zealand national consciousness as troops from both countries formed part of the Allied forces sent to the Dardanelles. Soldiers from France and its colonies also played a large role during the campaign. Bird’s pen name is based on the fougasse, a type of mine. Laying out the case for leaving the single market, Corbyn used language we have rarely heard from him – blaming immigration for harming the lives of British workers. An approach that will leave the UK outside of the Single Market.